0017 Kirsten January 2009 pattern. I used baby weight yarn to knit these clothes, but a sports weight works just fine. Nellie's jacket, on the bench, was knitted using Red Heart Designers Sport. When I first saw these patterns I thought they were the most beautiful doll clothes that I have ever seen. I wanted to make some, but I was afraid they might be too hard to knit. When I started on the first pattern I soon realized that all I needed to know was to knit and purl. If I had any questions about the patterns all I had to do was write to the website, and soon help was on its way. 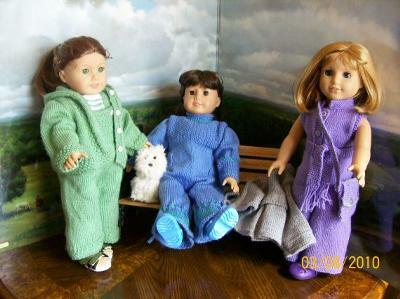 I am knitting for my granddaughter now, and she says her dolls are the best dressed dolls in the world. And I agree. These 3 outfits are so adorable. You picked lovely colors to do these 3 outfits. Just a beautiful set of dolls. I am glad that your granddaughter is enjoying them. So nice to hear from you Estela! Lovely dolls, and the clothes are very beautiful work! I am glad you ask when problems! That helps us to improve as well. I am in awe of this trio of beautiful outfits! I look forward to making some of these, as well, some day. Your granddaughter is very blessed to have such a talented and giving grandmother! Your dolls look lovely. I think you are so right about Maulfrids patterns, they look so sophisticated but are actually quite easy to make. Your dolls look lovely and Spring-like in their beautiful clothes. You really made a good point in how wonderful Kjell and Maulfrid are with customer service and knitting support.